Air foil clips are used on blowers manufactured by companies such as Trane, Carrier, Twin City, New York and Chicago Blowers. 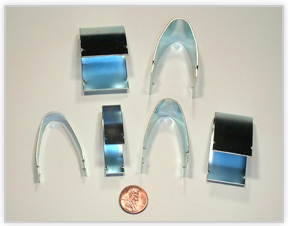 C D International offers Extra Wide, Narrow and Teflon coated Air Foil Clips in addition to the standard clips pictured below. 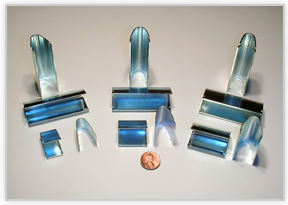 Standard Air Foil Clips have a 3/4″ opening or throat size. The clips average 1.1″ depth. These clips have a 1.1 inch opening or throat size. The depth averages 1.2 inches. Narrow Air Foil Clips have an average throat size of 0.550 inches and depth of 0.9 inches. Teflon coated air foil clips are suited to harsh environment and high temperature applications.